Have you ever played a gig where you had to go undercover to keep your life safe? I recently traveled to one of the most dangerous places in the world in order to prove that the art form of jazz can unite people in profoundly positive ways even in the most difficult and challenging of situations. My organization Jazz for Peace has played all over the world, but our concert last December in Lahore, Pakistan was one of the riskiest and most meaningful concerts I’ve ever played. The goal of the concert was to promote children’s literacy, which is especially important to me. The United Nations estimates that some 70 percent of Pakistan’s rural population is illiterate, with even higher rates for women. In Pakistan, kids don’t learn to read or write because they have to work at a very young age. I believe that both child labor and illiteracy can ultimately create people who feel they have no place in society, which can then lead to frustration, violence and even terrorism. 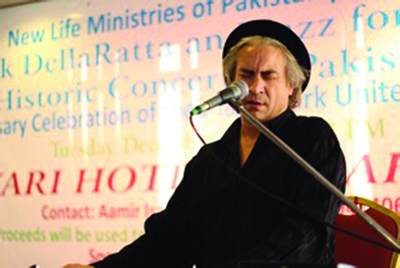 Local 802 member Rick DellaRatta performing in Pakistan. A few months before the concert, the State Department issued a travel warning and cautioned all U.S. citizens against non-essential travel to Pakistan. The warning noted that there had been 200 terror-related incidents in Pakistan in 2015 and that terrorists and criminal groups regularly resort to kidnapping for ransom. Then, a few weeks before the concert, an article came out in Pakistan that said the local churches were receiving terrorist threats as Christmas approached. Because of all of this, the original venue we had chosen was changed twice. We learned that no one would come to any concert held in a church, due to fear of attacks. We ended up at the ultra high-security Avari Hotel. With these serious concerns in mind and to divert attention, it was decided that it would be best if I arrived at the Lahore Airport in the early hours, around 2 a.m. I had recently been in Nepal, so I had appropriate clothing from the region, which I wore to help me blend in. I did not want to be targeted as a Westerner. I was told not to speak outdoors to anyone. I was driven in a sedan with black veils placed over the windows to shield my identity. The day before the concert, I was able to meet children and their teachers at one of New Life’s schools, where I played songs for them. I learned how to ask them things in their language such as their name, how old they were, and what they wanted to be when they grew up. Many of them said things like doctor, nurse, pilot, and other familiar jobs. Some wanted to be social workers, in order to help their community. My specialty is jazz but I knew the children were perhaps not familiar with the genre, so when I arrived at the first school I asked the teachers what Christmas songs they knew. I played some songs I had recorded on my holiday CD many years ago. I was then able to show the kids how a musician can create improvisation using familiar melodies. The kids responded with joy and enthusiasm. The evening was extraordinary and surreal. I was told that it was rare for American artists to perform here. I thought about all of this as I was shuttled back to the airport under the cloak of darkness. With our efforts to address illiteracy as well as assist outstanding organizations like this one continuing, it’s notes like these that keeps me going. Rick DellaRatta first joined Local 802 in 2004. His web site is www.JazzForPeace.org. Members of Local 802 are welcome to submit personal essays to Allegro for our MEMBER TO MEMBER column. E-mail Allegro@Local802afm.org.